Your dog’s teeth, and their care are vital in terms of keeping your dog healthy and preventing disease. Periodontal (gum) disease is the number one diagnosed problem in dogs; by the age of three, 80% of dogs have some form of periodontal disease. Lack of healthy teeth and gums can lead to heart disease, liver disease, kidney disease, stroke and even diabetes. In this article I will cover the dog teeth anatomy, the causes of dental disease, and the most important natural solutions to keeping your dogs teeth and gums healthy at home. Dog‘s start with deciduous (baby) teeth- similar to people. The teeth first erupt between the third and sixth weeks- at four months the puppies start to lose these baby teeth, and gain the full number of 42 adult teeth by the ages of 6-7 months. Some dogs have baby teeth that don’t fall out ( retained), and these can be extracted in a simple procedure by your veterinarian during the spay or neuter at 6-7 months. The signs of dental disease in your dog are similar to people. These include bad breath ( halitosis), reluctance to chew, redness at the gum line and visible tartar on the teeth. In advanced periodontal disease the teeth are loose, and may even fall out. Some dogs may be ill and quite sick if the bacteria from the mouth has spread to other organs, such as the heart or liver. Dental Diet. Ensure that your dog eats a dry kibble with larger pieces that have to be chewed. Some food companies now produce specific dental diets which will lower tartar buildup. They are more abrasive on the teeth and some contain an enzyme which lowers tartar formation. These foods are available at your local veterinarian. There are two herbs that can help your dog’s teeth. Calendula lotion can be used to heal ulcers in the mouth and promote healing of damaged tissue. Chamomilia can be used to decrease puppy and kitten chewing, alleviating some of the signs of teething pain. Myrrh can be mixed with water and applied topically to the inflamed gum tissue to decrease gum inflammation. Now you should be able to understand the importance of keeping your dog’s teeth healthy, and recognize the signs and symptoms of dental disease in your dog. 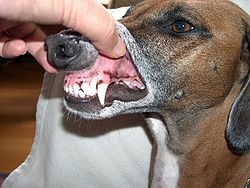 If you see red gums, visible tartar, bad breath or reluctance to chew, then your dog likely has periodontal disease. There are many things you can be doing to prevent and natural treat your dog’s teeth problems; the most important remedies include, specific diets, brushing, the use of supplements, and certain herbs for gum inflammation. I’ve been giving my dogs Pro Den since the end of October. I didn’t think it was working, but in the last couple of weeks, large flakes of plaque have been breaking off my malamute’s teeth. There’s still a lot to go, but this special seaweed does seem to work.